A Venetian Valentine’s date night – Yes please! Venice Ristorante Italiano. Need I say more? I love this place. The atmosphere is elegant and vibrant. The service is excellent. The food is wonderful. By the name, you can tell this is of Italian origin, as is the owner and chef, Alessandro Carollo, who began his culinary career in Palermo, Italy. Carollo moved to the United States after mastering his culinary skills in some of Italy’s finest restaurants. He, along with his Executive Chef Christian Delle Fave and Chef Cuisine Gabriel Aragon, work constantly to enrich their cuisine and provide guests with creative culinary works of art. Mission accomplished! Venice is romantic and intimate but within a bustling, vibrant and alive atmosphere. It is the ideal place for a romantic Italian meal for two, your own private niche within a large, fun Italian family. This is a place for you and your significant other or other adult companions to enjoy fabulous cuisine and a great selection of wine. You won’t find a children’s menu at Venice. Venice Ristorante is an unexpected surprise, tucked away in The Orchards strip mall on the southeast corner of Holly and Orchard in Greenwood Village. Inside the restaurant, the ambiance is a chic twist on Old World Italy. White linen tablecloths, candles, draperies hanging from the ceiling, subtly sketched wall murals, waiters dressed in white dress shirts and ties…it all adds up to that feeling of going somewhere special and is conducive to that kind of meal where you take your time, sip your wine and enjoy some good conversation. Venice has its share of hustle and bustle, and it was full to capacity the night I went – on an average Wednesday. Reservations are definitely recommended. As you enter, the bar on the left is small yet elegant and has televisions so you can catch the latest sporting events. We had reservations and were taken to a nice table next to the window. 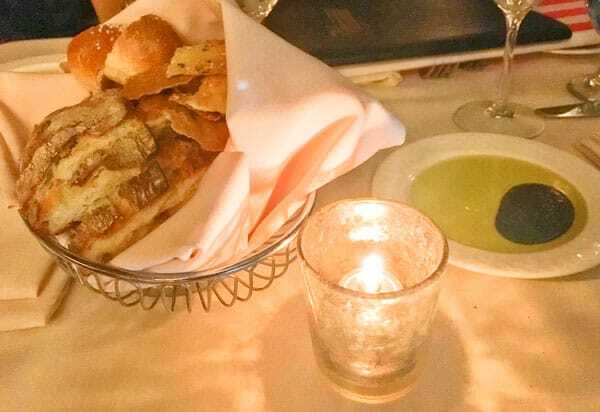 The waiter quickly brought us a lovely basket of fresh rustic Italian bread and poured the traditional olive oil and balsamic vinegar combination on a plate for our dipping pleasure. We perused the extensive wine list on a digital tablet before delving into the hard-bound menu to make our selection from the abundant choice of dishes listed in Italian. 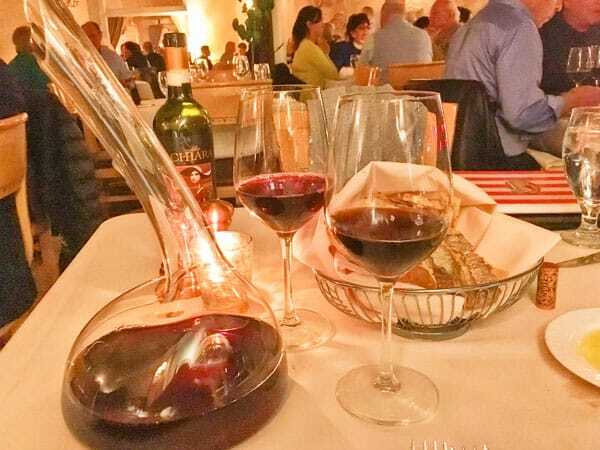 We selected a nice Chianti to start, which the waiter brought out and poured into a decorative decanter to breathe. I don’t know for sure if the decanter made a difference, but the wine was full bodied and very flavorful. Our waiter was attentive; he checked on us frequently yet never made us feel rushed to order. We decided on the Carpaccio d’ Alba or beef carpaccio for an appetizer. It was a wonderful combination of thinly sliced filet mignon, baby arugola, crispy capers and shaved Parmesan cheese with just the right amount of lemon vinaigrette and white truffle oil. 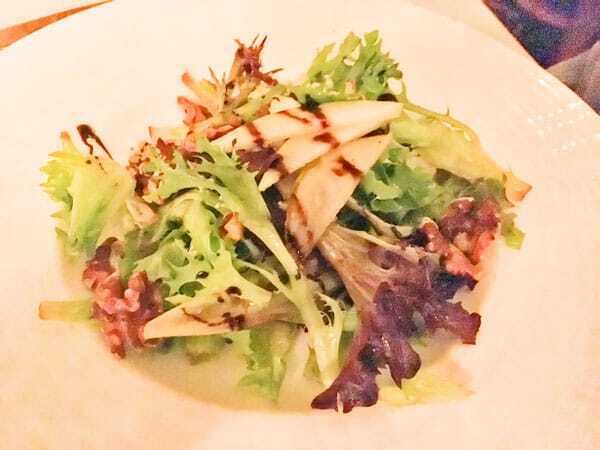 Next we indulged in the Insalata di Pere or pear salad, which we split. It was again very tasty and beautifully presented with crumbles of Gorgonzola, toasted walnuts, a Champagne vinaigrette, greens, and of course, pears drizzled with a balsamic reduction. With much anticipation, we progressed to the main course. After debating for a while – many options sounded wonderful – I decided on the Scaloppine ai Porcini or veal scaloppine with porcini and cremini mushrooms in a Marsala wine sauce and parisienne cut vegetables. My husband chose the nightly special Ossobuco di Vitello, which is a Milanese specialty of cross-cut veal shanks, bone in. My scaloppine came with a side of soft garlic polenta and the ossobuco came on a bed of soft Gorgonzola polenta, which enhanced the flavor of the ossobuco. The Marsala sauce was luscious and the meal was fabulous. While I boxed up some of my veal to take home, we still managed to make room for dessert. Being a lover of chocolate mousse, we opted for the Profiteroles al Cioccolato, a combination of dark pastry puffs filled with Chantilly cream and covered with a dark chocolate mousse. The taste was a good combination of heavenly cream, crunchy chocolate mousse and a touch of raspberry sauce for that oh-so-right sweet and tangy little zing. There was extra whipped cream on the side as well as a delectable chocolate covered strawberry. 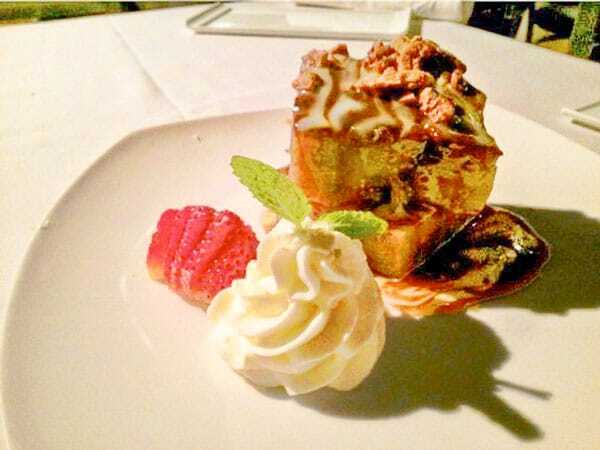 I would highly recommend you visit Venice Ristorante for your next date night. There are also two sister restaurants, Venice Ristorante & Wine Bar downtown Denver at 1700 Wynkoop Street and Chianti Ristorante at 5121 South Yosemite Street also in Greenwood Village. Venice also offers catering through Eclectic Creations by Venice with a wide array of catering options, including lunch boxes and event pans, which have been designed to simplify any corporate or personal event such as graduations, birthdays and family gatherings. Venice Ristorante is open for lunch Monday through Friday from 11 a.m. to 2 p.m. and dinner Monday through Thursday from 5 p.m. to 10 p.m.; Friday and Saturday from 5 p.m. to 11p.m. ; and Sunday from 5 p.m. to 9 p.m. It is located at 5946 South Holly Street in Greenwood Village. 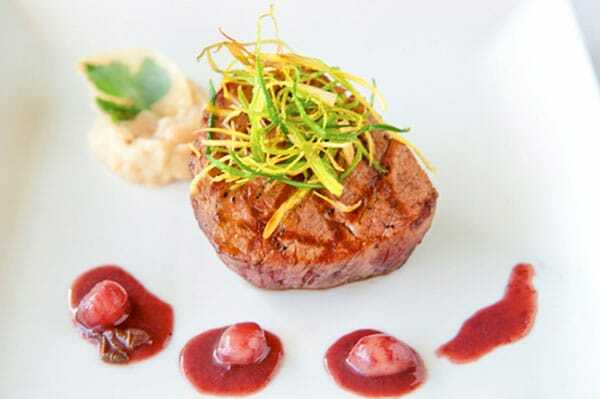 For additional information, call 720-482-9191 or visit www.veniceristorante.com. Each month The Connection Food & Dining guide features a restaurant we think our readers will enjoy. With February being Valentine’s month, we decided to spotlight a place that would be a great option for a romantic date night. Venice Ristorante is just the place! It is a cozy restaurant with wonderful ambiance and excellent food. As always, our writer dines at a restaurant unannounced so that an unbiased experience can be shared with our readers. A restaurant cannot pay to be featured, and there is no charge to the restaurant once they have been selected. All restaurants that we have spotlighted in the past are listed on our website; visit www.castlepinesconnection.com.